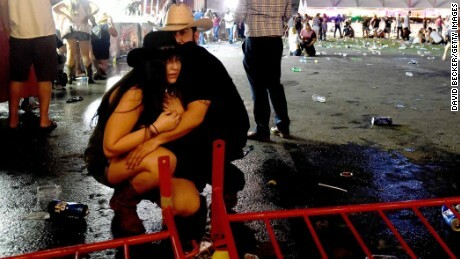 What happened: At least 59 people were killed and more than 500 hurt in a shooting last night. Witnesses said it lasted 15 minutes. The suspect: The gunman, 64-year-old Stephen Paddock, is dead. He was not known to authorities. If you're looking for a missing loved one, call (866) 535-5654. 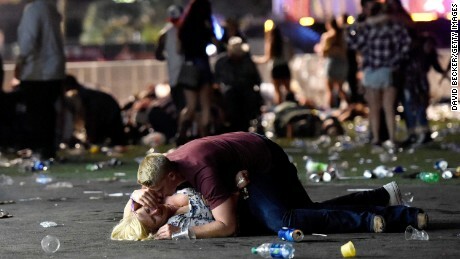 Shooting survivor: “I thought that I was gonna die"
Las Vegas shooting survivor Kimberley Folle said she began calling her loved ones the moment she realized what was happening. “I thought that I was gonna die," she said. "I was just running as fast as I could, calling everybody that I could think of to let them know what was going on and just to say, you know, I loved them." Folle said she called her parents, sisters and friends as she ran.